Raising the Flag on Iwo Jima is a historic photograph taken on February 23, 1945, by Joe Rosenthal. 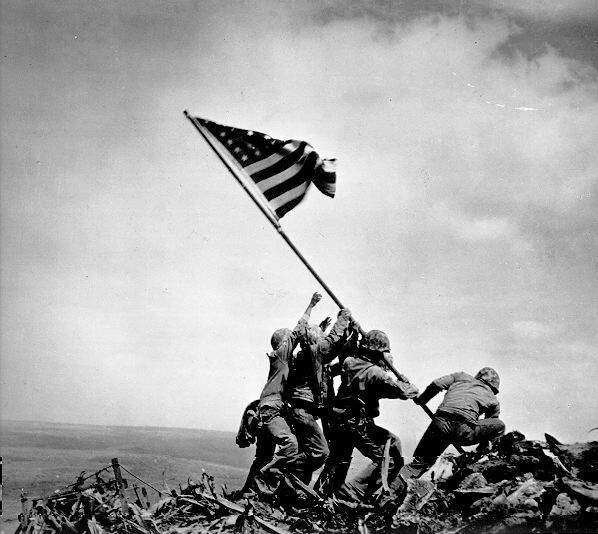 It depicts five U.S. Marines and a U.S. Navy corpsman raising the flag of the United States atop Mount Suribachi during the Battle of Iwo Jima. The American victory was an important milestone in the ultimate surrender of Japan in August of 1945, marking the end of World War II. Rosenthal, Joe. Raising the Flag on Iwo Jima – 1945. Accessed 24 June 2010. Fifty Years Later, Iwo Jima Photographer Fights His Own Battle. ap.org. Accessed 25 June 2010. The Oxford Companion to the Photograph. Editor: Robin Lenman. Oxford: Oxford University Press. 2005.